YOUR PRIVACY ON THIS SITE IS OUR FIRST PRIORITY! This privacy notice discloses the privacy practices for SwitcHHat™ (SwitcHHat.com). 1. What personally identifiable information is collected from you through the Web site & our mobile apps, how it is used and with whom it may be shared. 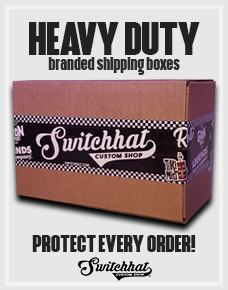 SwitcHHat™ is fully committed to protecting your privacy. We are the sole owners of the information collected on this site and our mobile apps. We only have access to collect information that you voluntarily give us via e-mail or other direct contact from you. We do not distribute your personal information to outside parties. We will not sell or rent this information to anyone. We use the information we collect to enhance your shopping experience at our web site and mobile apps. We will use your information to respond to you, regarding the reason you contacted us. We will not share your information with any third party outside of our organization, other than as necessary to fulfill your request, e.g. to ship an order. SwitcHHat™ may monitor your use of this website, and will only disclose information and materials received from you or collected through your use of SwitcHHat™ when presented with a vetted and valid court subpeona.